The SEL0051 connector is fully compliant with ISO15031-3.6. 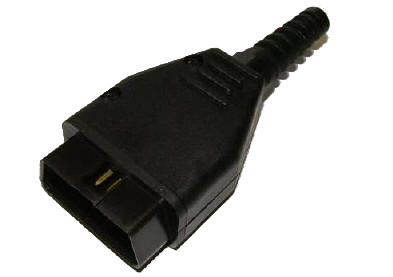 This standard details both the vehicle connector physical dimensions and the requirements of the diagnostics connector. Below is a drawing of the Type A (12v connector), the Type B (24v connector) does not have a complete void between the pins but two shorter voids with a solid section in the middle. The SEL0051 connector is a low cost alternative to the durable connectors 16F30C and 16F33B ruggedised connectors and is suited to low volume applications in either manufacturing, after sales or hobbyist applications. The SEL0051 is supplied as a kit of parts (as shown below), the user can solder their own cable to the pins and clamp the cable into the back shell using the spiral gland. 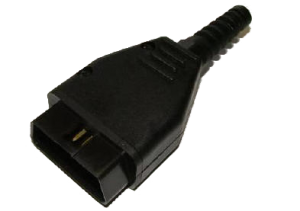 As a low cost connector the SEL0051 is fully populated with gold plated fixed blade pins that insert into the female receptacle within the vehicle connector. Available as either Type A (12v systems) or Type B (24v systems). Delivery is typically 3 – 5 days when available in stock, and can be purchased directly from our online store.